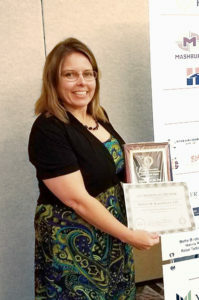 Nichole Kopenhaver, McCrory Construction, was selected as the 2017 Member of the Year for the South Atlantic Region. Kopenhaver was honored at the 2017 Spring Forum Gala held at the Myrtle Beach Marriott Resort and Spa at Grande Dunes, Myrtle Beach, SC, on April 22, 2017. Qualifications for the NAWIC Member of the Year are that the candidate must be a member in good standing of the South Atlantic Region. She should also be chosen for her accomplishments and contributions to the Chapter during the current NAWIC year. 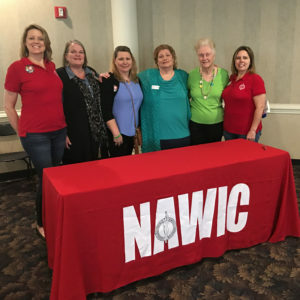 NAWIC Chapter #113 is selling Luminary bags for Relay For Life event that is scheduled to take place on May 19, 2017, at 6:00pm, at Lexington High School, 2463 Augusta Hwy, Lexington, SC. The Luminary bags will be decorated and include the name of the person that is being honored. Requested donation is $10 per bag (cash or a check made out to American Cancer Society). Please contact Dana Jacobs, Sign it Quick, dana@signitquick.com, or Suzette Porth, Clyde Nettles Roofing, suzettep@clydenettles.com for more information. Click here to learn more about Relay for Life. Please join us for our 33rd Annual Tournament to be held at The Windermere Club, 1101 Longtown Road East, Blythewood, SC 29016, on Friday, May 19th, 2017. Shotgun start at 9:00am. Deadline to register is May 13th, 2017. Please contact Krystal Young, Carolina Tap & Bore, at 803.739.7056, kyoung@carolinatapandbore.com; or click here for more information regarding registration and sponsorship. Please join us for the 50th Anniversary Celebration of NAWIC’s South Atlantic Region. 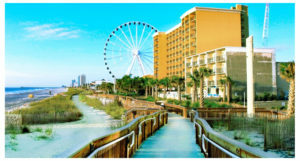 NAWIC Columbia, SC, Chapter #113 will host the 2017 Spring Forum at Grande Dunes in Myrtle Beach, SC. 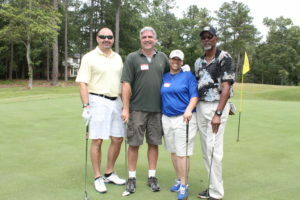 Please contact Debbie Edwards, Premier Lighting and Control at 803.754.1959, debbie@premierlightingsc.com, or Sheila Nelson, McCrory Construction at 803.251.8137, SNelson@mccroryconstruction.net or click here for more information regarding registration and sponsorship. 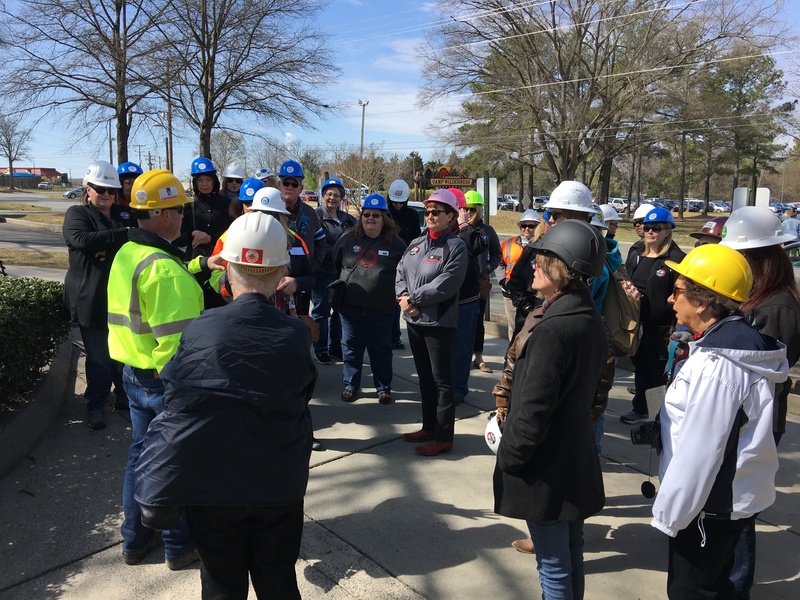 NAWIC members from the Columbia, Charlotte and Greenville chapters enjoyed a tour of the the new “County Fair” addition to Carowinds on Saturday, March 11, 2017. Lunch at T-Bones on the Lake immediately followed. 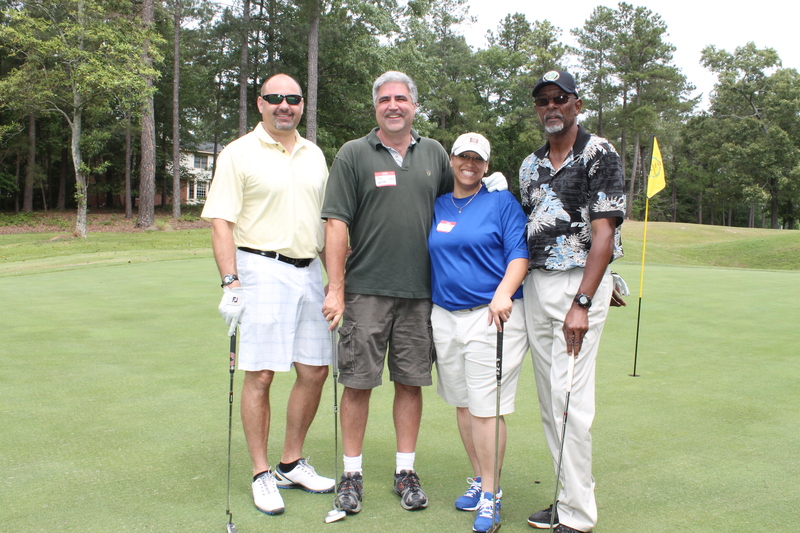 Members enjoyed fun and fellowship and getting to know new friends. Columbia, SC, Chapter #113 participated in the MEBA Blueprint For Your Future event on March 10th which is a field study and panel discussion designed for 11th and 12th grade students who have already selected architecture and construction as their personal pathway. Our members were available for questions on our industry and also provided scholarship information to the 80 students. This event took place at the State Fairgrounds – 51st Annual Home and Garden Show and chapter members in attendance were Darla Moore (Hood Construction), Susan Clary-CIT (Contract Construction, Inc.), Rhonda Baker-CIT (Prez-Chem), Jane Andrews-Nicol-CIT (Mashburn Construction) Tia Hudson (Metcon), Virginia Davis-CIT (retired), Rhae Sutphin (Watts and Associates), and Nichole Kopenhaver-CIT (McCrory Construction). 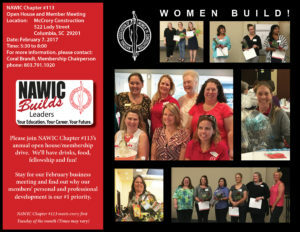 NAWIC Chapter #113 welcomes its newest member, Erin Porter, PMP, P.E. engineer for HPG and Company, Consulting Engineers, Inc! HPG and Company, Consulting Engineers, Inc is located in West Columbia and primary focus is civil and environmental work for local government. They continue to work on solving engineering problems for our clients including water, wastewater, storm water, roadways, site work and other related work. 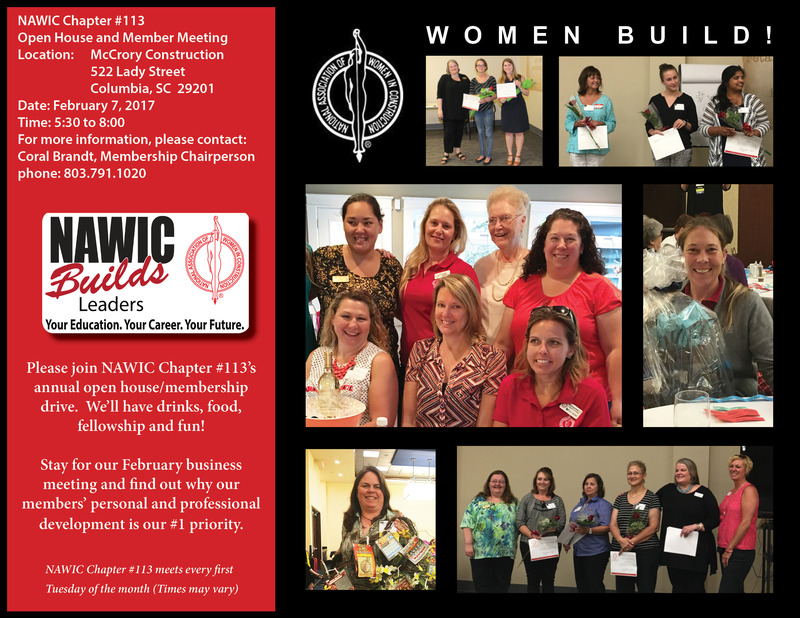 NAWIC Chapter #113 welcomes its newest member, Pamela Richards, Director of Membership: Columbia & Lowcountry for ABC Carolinas (Associated Builders and Contractors, Inc)! We welcome our new business partner ABC Carolinas and look forward to learning more about Pamela! Associated Builders and Contractors (ABC) is a national trade association representing 22,000 members from more than 19,000 construction and industry-related firms. Founded on the merit shop philosophy, ABC and its 72 chapters help members win work and deliver that work safely, ethically and profitably for the betterment of the communities in which they work. ABC’s membership represents all specialties within the U.S. construction industry and is comprised primarily of firms that perform work in the industrial and commercial sectors of the industry. Columbia Chapter 113 has a new employer sponsor and a new member! admin November 18, 2016 November 18, 2016 Comments Off on Columbia Chapter 113 has a new employer sponsor and a new member! 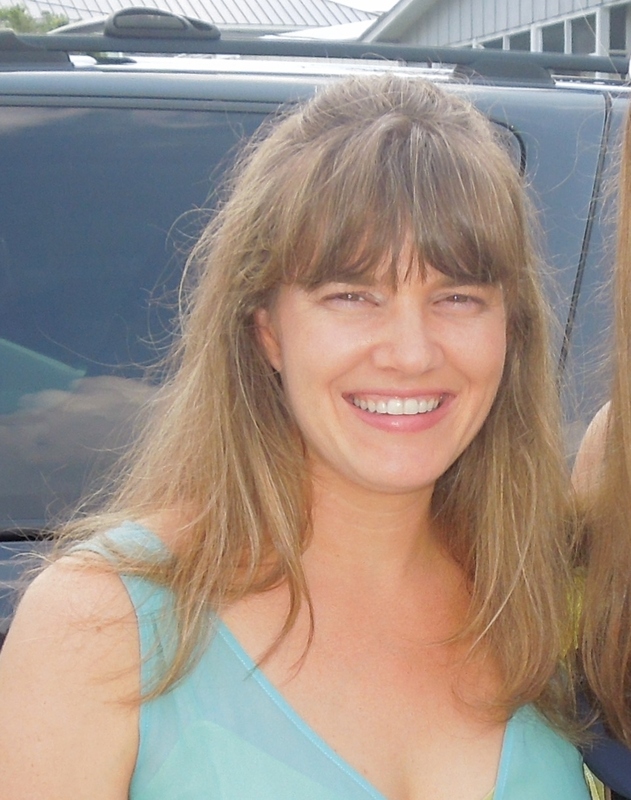 Please join our chapter in welcoming our newest member, Jill Surface who is a Project Manager with Vulcraft South Carolina a division of Nucor! Her office is based in Lexington, SC and we look forward to learning more about Jill and Vulcraft. Vulcraft Corporation was founded in 1946 in Florence, South Carolina as an industrial steel fabrication facility. In the fall of 1954, the company began manufacturing long and short span joists exclusively. Vulcraft – South Carolina became a member of the Steel Joists Institute in May 1959 and was subsequently purchased by Nuclear Corporation of America in September of 1962.